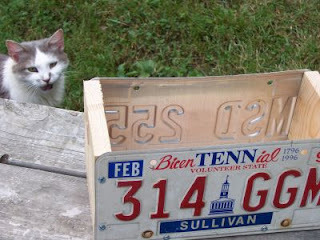 So what do you do with those old license plates after they expire or you get rid of a car? Sure you could can toss them, or maybe you live in a state where you have to turn them back in. I found myself we several of them on hand so here is one idea. 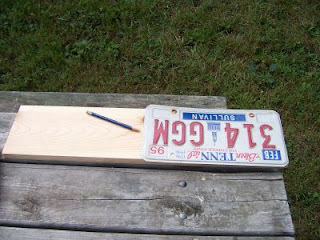 Needed are (2) plates, one board 24"x6"x1", a handful of wood screws and a couple of short bungee cords. 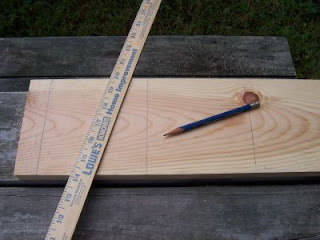 Measure your first cut on the board with a license plate itself. This is the bottom of your tool tote. 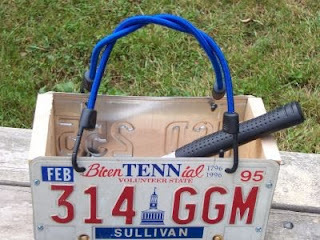 The plates I have are 6"x12" and suppose that is standard for all states. 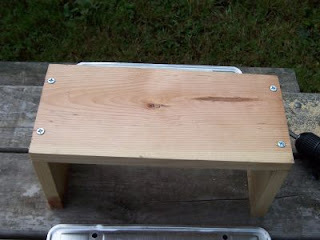 Now prepare the bottom of your tote by drilling two holes along each edge that will support a side. Set these holes approximately an inch from the long edge and 3/8" from the short edge. This is where the screws that support the sides will be placed. Now that you have the bottom holes drilled ,set each side in place and use flush mount type wood screws to secure each side to the bottom. 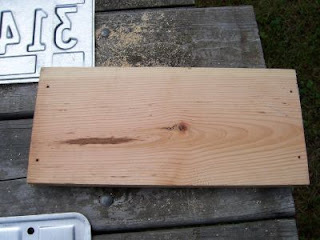 If you want to add wood glue at this joint then please do before attaching the sides to the bottom. It's not necessary, but it won't hurt either. 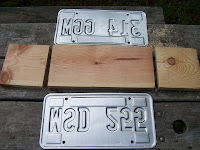 Now prepare the license plates to attach to this bottom and side structure by punching with a nail. You need at least 2 punches per edge. I did six. They were spaced about 1 1/2" on the short edges and about 3 inches along the bottom edge. After punching use your drill and open the holes up to accommodate your screws that will secure each side. Place the plates in their proper locations while drilling to prepare the side and bottom simultaneously. After all holes have been drilled then secure each plate to the side with the remaining screws. Make sure each screw sets well and pulls the plate flush with the side or bottom. That is Sally in the picture to the right, helping out like she often does, and admiring my handy work. Next for the handles, I opted for two 18 inch bungees, twisted together and inserted into the top mounting holes of each plate. If I put this in my truck bed or trunk of my car, then I often need a bungee so this can serve double duty. You can use other options for a handle, from an old belt to duct tape, whatever works best for you. So now I have a tool tote that is uniquely mine, reflective at night and can be traced back to me through the Department of Motor Vehicles.